Everywhere I go these days, my friends slam laptops. They tell me my PC of choice is a dying breed and sing the praises of their new, "post-PC" Apple iPad. They carefully pull out their Apple device. I admire it and then say: "So where do you insert the DVD? How do you bang out a long e-mail on a touch keyboard? 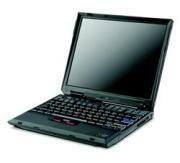 Oh, and guess how much less I paid for my little Lenovo ThinkPad X30 laptop than you did for your iPad." If you're willing to take a chance on used equipment, you can find slightly older laptops on Craigslist starting at about $200. Also check out PCWorld's Daily Deals. My ThinkPad has a CD and DVD player/burner: If you're into permanently saving photos, music, or movies, or if you're serious about backing up your hard drive and programs, you probably need to burn discs occasionally. Your relatives in Indiana need a copy of the video of cousin Paul's drum recital, or they'd love to look at a CD containing pictures taken during your night trip to Alcatraz. You can't cram everything onto Facebook. It has a physical keyboard: Most iPad users readily admit typing data-intensive text on their tablet's touch keyboard is difficult. I'll go further: I detest typing on a touch keyboard. As PCWorld reviewer Jon L. Jacobi sarcastically puts it: "Overpriced pads: Touchscreens without keyboards. How innovative." Flimsy, add-on keyboards don't cut it. Give me a solid, built-in board like the one on my ThinkPad. It's one of the best laptop keyboards ever, and I still like the old-school Trackpoint eraserhead cursor control. It has useful and versatile ports: No USB port on an iPad? Sure you can buy a pricey adapter, but what if you want to plug in a mouse, digital camera, and/or printer? So much for the iPad's smooth lines and ease of use. Being able to insert a USB device or a thumbdrive into my laptop is essential to me. As for Apple's iPad, here are a few of my least favorite things about it. The iPad doesn't support multitasking: As a result, I can't listen to sports talk radio online, check to see if little Charlie has bitten anyone else's finger, and type my blog, all at the same time. Such versatility is why I love mobile computers--and it alone will ensure my allegiance to laptops. Its battery isn't replacable: I know the iPad has respectable battery life, but if you ever have to work on a long plane ride and in a café with no available power outlets, you need excellent battery life and a back-up cell that is easy to install. This isn't possible on either model of iPad. As on all other Apple mobile devices, the battery is sealed and nonreplaceable. Where do you stand on the laptop/netbook versus iPad issue? Let us know in the Comments section.